This is a replica of a historical weapon from India that has gained widespread popularity and appeal from its appearance in a wide number of video role playing games dealing with heroic adventurers or assassins. This traditional Indian punch dagger features full stainless steel construction with a 10" blade. This piece measures 17" overall and includes a leather sheath. This is a great item for the historical collector or video game enthusiast. Purchased one to conceal as an assassins weapon. Tarnished black hides perfectly in night. I went ahead and bought two of these a year or two back, I just never got around to writing a review until now. These katars are definitely worth the $20. I have a small collection of blades, and of them all, these came the sharpest out of the box and have held their form all throughout. I've sliced through boxes, bottles, and shrubs with them, all with ease. As far as bottles go - Its possible (maybe after a touch up of sharpening if not at first) to stab or slice water bottles so cleanly that they will not spill. I have time and time again stabbed water bottles and the like just to see how my friends would react. Jaw dropping and "what the?" 's are the two most common replies. I definitely recommend these for anyone who wants a katar or two. The only thing I would recommend is that if you plan on doing anything more than cutting or stabbing through something harder than I guess saplings - it may be a good idea to weld (or have someone else) the blade to the handle portion for that extra hold. I finally broke down and bought one. I wasn't real impressed with the one I received. There is a pretty good gap between the blade and handle. The blade is a bit crooked to the handle also. I wasn't expecting much and only plan to beat the heck out of it anyway. I punched right threw the door of my pickup truck and its still sharp!! Wow... this is awesome. It was extremely sharp when it arrived, very clean and smooth. It feels great in the hand, and looks deadly strapped to the belt. I highly recommend it. Very good deal, needed a little sharpening, however not bad. so within a day or two i got my set of then early morning today and i am overall pleased with them. 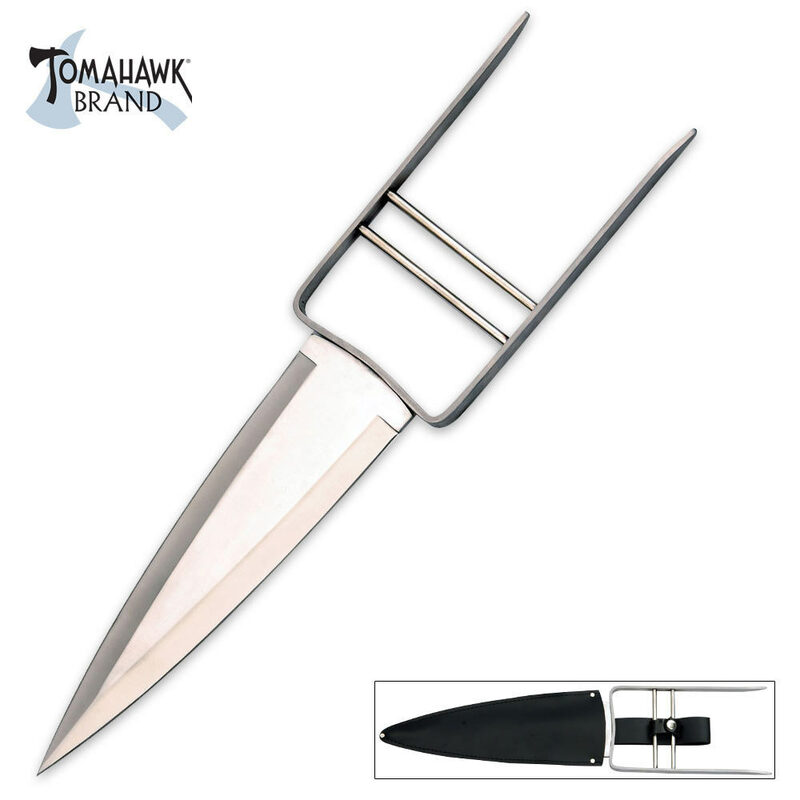 they are quite sharp, and the blade is well fixed, with the quality that generally comes from "Tomahawk". the leather casing was also uprizingly good. but as mentioned the metal is easy to pick up finger prints, but a quick clean and there gone. all in all a great buy. Let me explain something... I play alot of video games(geek alert), and I always like playing the assassin classes. One thing that always stood out on them was the stealth and Katar weapons. When I was only 10 years old I promised myself I would own a pair of these someday, now 8 years later that dream has come true thanks to Tomohawk and TrueSwords. For $40 for two of these I felt they might be lacking in the quality department, then I read reviews and knew I would try them out. Man was it worth every cent with these babies. I dont plan on using them for anything special, just a great conversation piece for my gaming and history(this is an indian weapon) memorabilia. You really cant put a price on these to me, because they meant so much, thanks again trueswords. You always deliver with amazing urgency and high quality. By the way, I ordered this Feb14 at night and got it Feb16 during the early day.